After 18 years in the financial services business I've spoken to a lot of people. And in every first meeting with someone I always ask the question, “What are you concerned about heading into retirement?” or if I know someone's already been retired for awhile, “What are you most concerned about in retirement?” And believe it or not most people are all concerned with the same stuff. “I’m worried that my dreams won’t come true.” Dreaming about what you're going to do in retirement should be the best part. In fact most people have had dreams that they’ve been thinking about for years, maybe even all the way back to your school days. I've always wanted to travel to ________ , or I've always wanted to own a _________, everyone's different and one of the best parts of my job is the opportunity to listen to people’s dreams. But along the way sometimes we lose track of those dreams, we get busy with life and then we blink and were staring at retirement. So my piece of advice to you is to write down your dreams and review them on a consistent basis. However, just writing something down, typically called setting a goal isn’t enough. You have to find a way to do the things that will make your dreams come true. So start by asking yourself, what do I need to do this year to get me closer to my dream? Next ask yourself, what do I need to do this month to get closer to my dream, then, what do I need to do this week to get me closer to my dream, and finally, what do I need to do today that’s going to get me closer to my dream. Break the steps down into smaller manageable bites. If you can consistently right out and track what you have to do to reach your dreams you will hold yourself accountable and have a better chance for success. “I’m worried about healthcare costs.” 2 out of 3 Americans today are considered overweight and not in good health. One of the biggest reasons for bankruptcy in retirement is due to healthcare related expenses. So it's not uncommon for me to hear that people, who are retired or getting close, are very concerned about healthcare costs. I firmly believe that if you can have good health you'll keep more of your wealth and that in turn will let you do the things that you want to do in retirement. So my tip for you today is to start exercising more and eating healthier. Maybe take a walk every morning while it's nice and cool outside, maybe look at joining a gym, maybe even ask a few of your friends to join with you, it's always more fun to suffer as a group. But, remember to ask your doctor first before starting any kind of a fitness or nutrition program. Along with taking better care of your health and lifestyle choices, you need to understand how Medicare works, and the various supplemental insurance programs that are available to you. Becoming educated on your plan choices will not only save you a lot of money, but give you better choice of doctors and hospitals. “I'm afraid of another market crash.” I hear this one all the time, and it's not very surprising given that every day when you turn on the TV or read something in the newspaper the media does a wonderful job at freaking people out. Here's my advice to you, learn how to ignore the media. Take a little time and understand how the markets really work, and the historical returns of the market. You'll begin to see that given enough time the market always goes up. Now does that mean that we won't ever have a crash again? Absolutely not, we're for sure going to have another crash, the problem is my crystal ball hasn't been working lately so I can't tell you when it's going to happen. So make sure you have a solid plan in place that can set up your portfolio appropriately to weather any market storm. But always remember that even after a bad storm, the sun always comes out. “Do I have enough money to retire?” I get this question a lot from people who don't quite understand how much money they will actually need to live in retirement. You need to understand that in retirement, it's all about the income. You should ask yourself where’s my paycheck going to come from when I no longer receive a paycheck? None of us really like doing budgets but here's a tip to help you trick your brain a little bit. Don't call it a budget, call it a spending plan. We all like to spend money, so why not have a plan in place to do it? “I’m scared of running out of money in retirement.” Yes, outliving their income in retirement is the number one fear that people have when they come in to see me or when we visit on a phone call. What’s interesting is that it really doesn’t matter how much money people have. Wealthy people are just as concerned about their income as someone with modest means. The main reason people have this concern is because they don't have an income plan. Would you drive across the country without having some kind of a road-map to show you where you're headed? 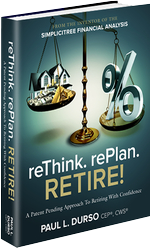 Most of us would say no, but that’s exactly what the majority of retirees are doing today with their money. Heading into retirement or even being in retirement without a plan is like driving down the road at 100 mph blindfolded. Not the safest thing to do. When you have an income plan in place, the blindfold comes off revealing a big clear windshield in front of you. Now you’re able to drive safely, and give yourself the best chance to avoid any accidents and have a successful retirement.